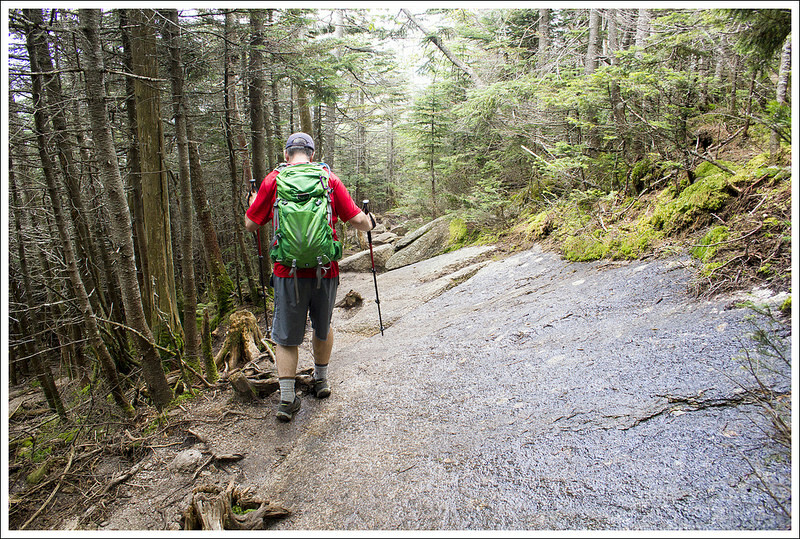 This moderate 6.4 mile hike with take you to the top of 4,315′ Mount Osceola. The trail is very rocky, but the ascent is moderate and non-technical. 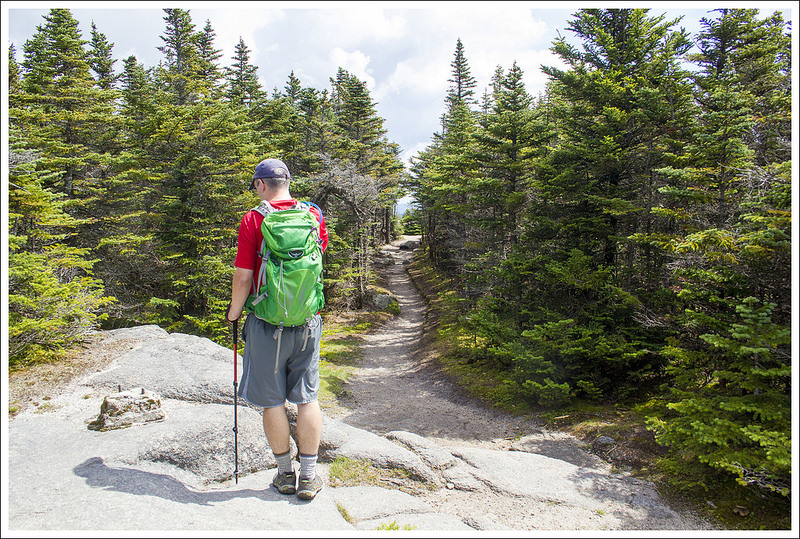 It’s a great choice for newer hikers looking to bag their first 4,000-footer in New Hampshire. 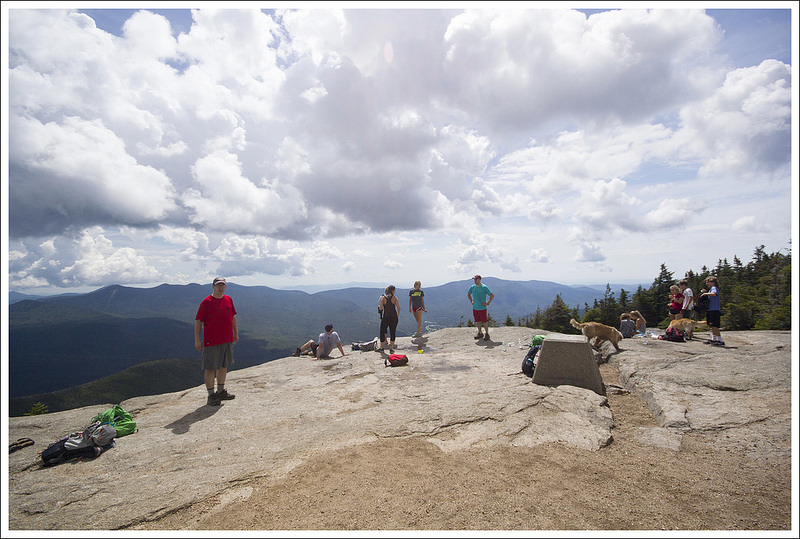 Mount Osceola is one of New Hampshire’s most accessible 4,000-footers. 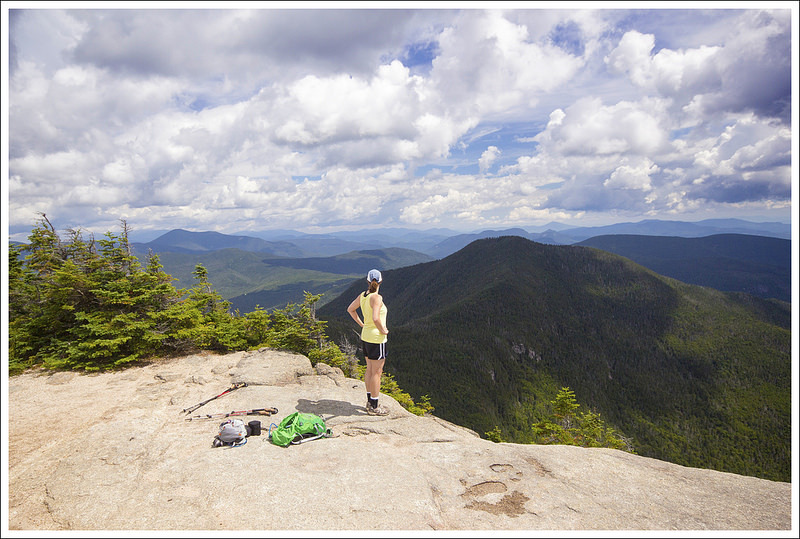 For our final hike of the week in New Hampshire, we wanted to do another 4,000 footer. We settled on the 6.4 mile hike of Mount Osceola. The mountain stands at 4,315 feet, but the hike only requires a little over 2,000 feet of vertical gain to reach the summit. It’s a very moderate climb. 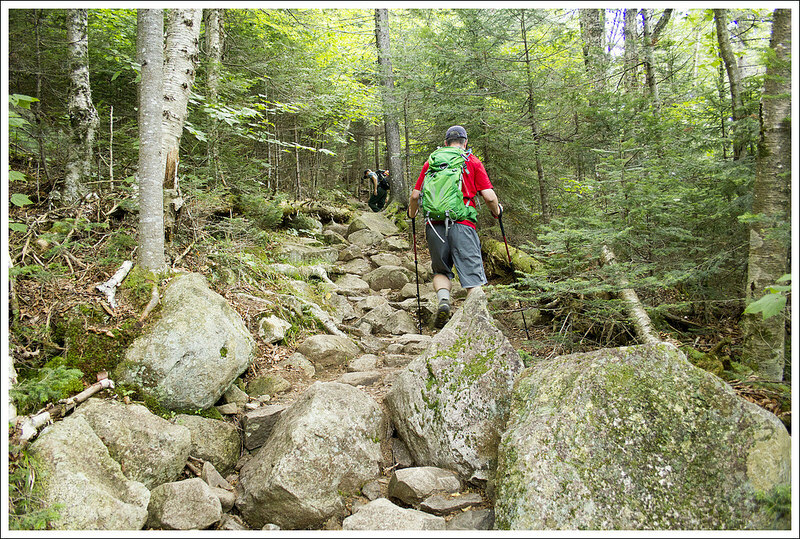 We also read in our guidebook that it was also a rocky hike – even by New Hampshire standards. Located off Tripoli Road, the hike was quite close to my parents’ house. It was nice to have a short drive after spending so much time in the car on our Mt. Washington day. We were also blessed with another beautiful weather day –sunny, warm, and a blue sky full of big, puffy clouds. On the way to the trailhead, we passed so many fantastic backcountry campsites. I think next time we visit New Hampshire, we’ll bring our overnight gear and do something multi-day. The route up Mt. Osceola is about as straight-forward as you can get. The trail goes all the way to the top without crossing a single trail junction. It would be nearly impossible to get lost! As our guidebook promised, the trail was rocky. Personally, I didn’t think it was any rockier than other local trails. I suppose the rocks were smaller and looser than a lot of the other area trails. It would be easy to lose your balance or turn an ankle on this terrain. In fact, I recently read on Facebook that a woman had to be carried off the Mount Osceola trail by local search and rescue after slipping and breaking her leg. Still, I think I prefer this kind of rockiness to slippery slabs and boulder scrambles. The hike up Osceola was quite rocky. 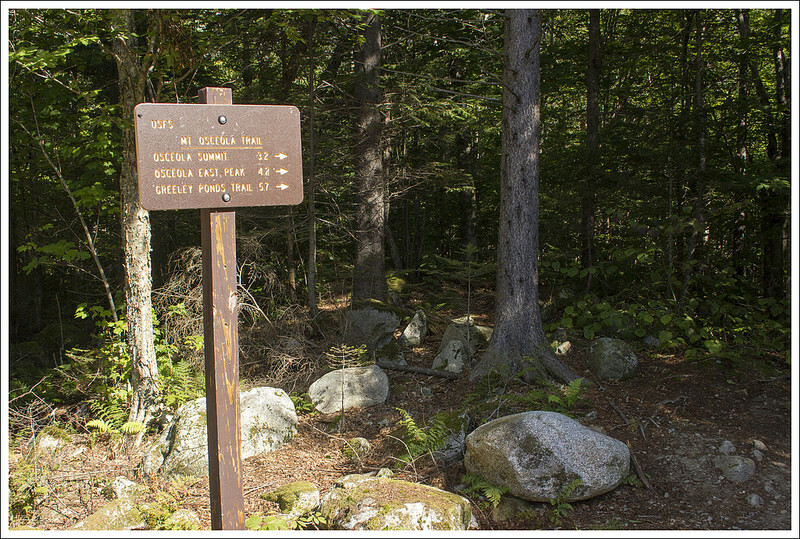 Below: Trailhead signage; Slabs of granite; Views of Tecumseh mountain skiing. Generally, the climb up to the summit was very gradual and (dare I say) easy compared to other hikes we’d done recently. We passed a forest service crew working on trail improvements. We also passed quite a few slower hikers. Mount Osceola and Mount Garfield are believed to be the easiest and most accessible of the 4,000 footers. A lot of novice and not-regular hikers choose these mountains to garner experience before moving onto bigger things. As we climbed, we got some nice views of the Mount Tecumseh ski area. Near the top, the trail flattened out. We passed remnants of an old fire tower and then came out on a wide, open ledge. The view is first rate! 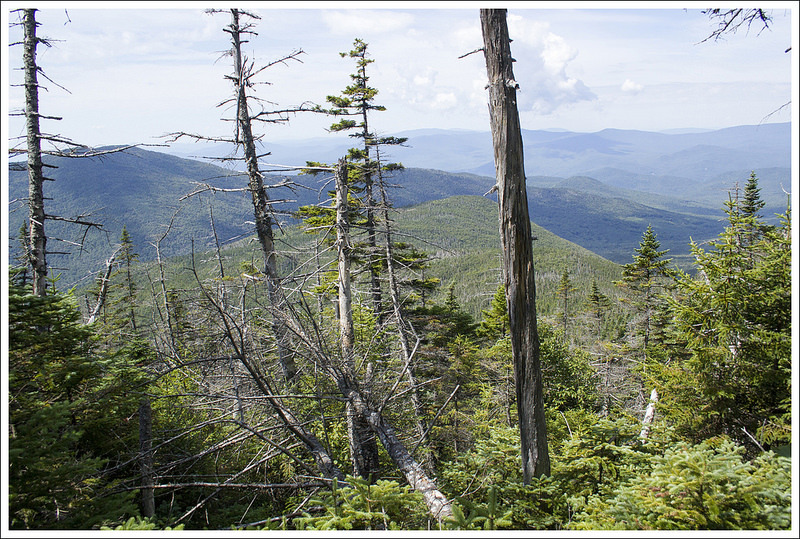 I read somewhere that you can see 41 of 48 of New Hampshire’s 4,000 footers from the summit. We spent more time than usual at the summit. We ate snacks and took photos. We were both really grateful for having over two weeks of vacation time, beautiful weather, and the chance to hike lots of new places. 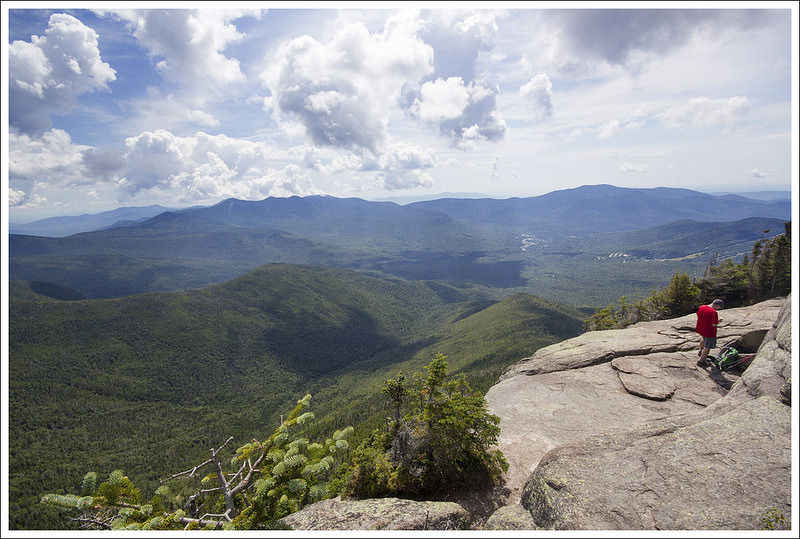 New Hampshire and New York are places we both want to visit again! After a long stay at the summit, we hiked down the mountain. It was over before we knew it! I always feel a bit sad on final hikes of vacation weeks. We made the short drive back to my parents and spent the afternoon packing and getting ready for the long drive back to Virginia. We decided to have one final celebratory meal out at the Six Burner Bistro in Plymouth. The food there was creative and amazing. It was the perfect end to our time in the Granite State. Tangled forest near the top of Mount Osceola. 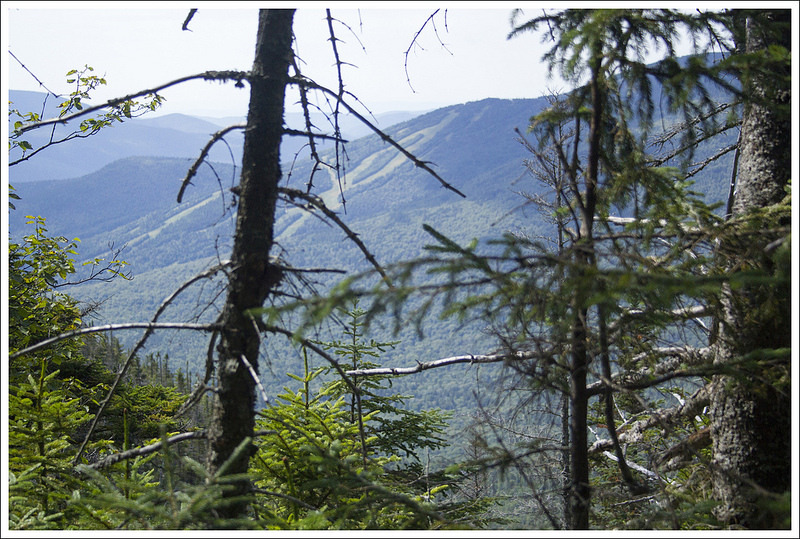 Below: First views from the trail; Passing the base of the first fire tower ruins; Views over the evergreens from a spur trail near the summit. As Christine mentioned, the hike up Mt. Osceola is an accessible trail for those that want to try their hand (or feet) on a 4000-footer . 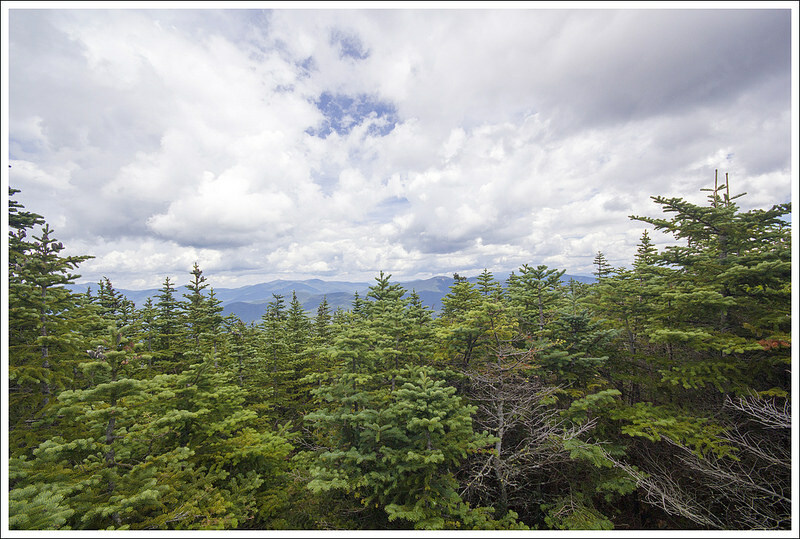 New Hampshire has 48 mountains that are 4000 feet above sea level and Osceola is the 24th highest of the 48 4000-footers, coming in at 4,340 feet. This was named for the 19th century Seminole leader. I’m not sure why they decided to name a mountain in New Hampshire after a Native American in Florida, but his name is also the name of cities in Missouri and Wisconsin. The hike up Osceola was quite rocky. This is one of those hikes where you do have to watch every step you take and your feet and knees will feel it after the hike, especially if you aren’t wearing good shoes and using trekking poles. Christine takes in the nice summit view. 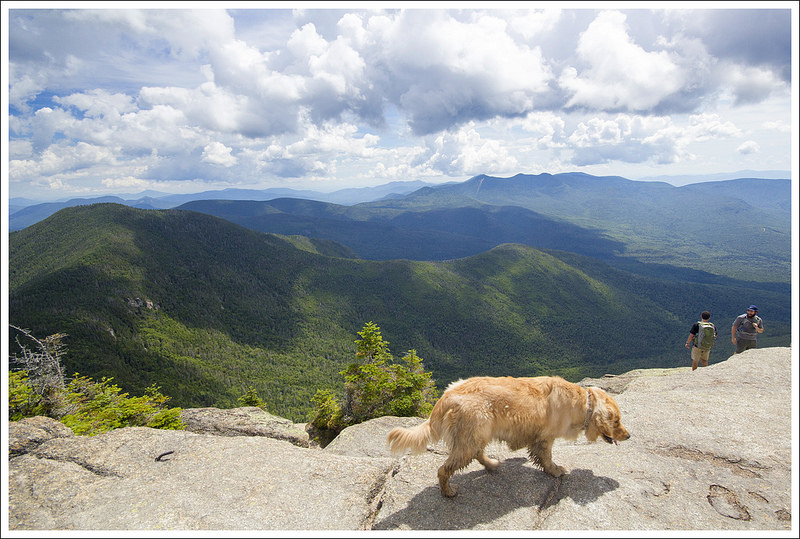 Below: Muddy dog; View into Waterville Valley; Crowds atop the summit. 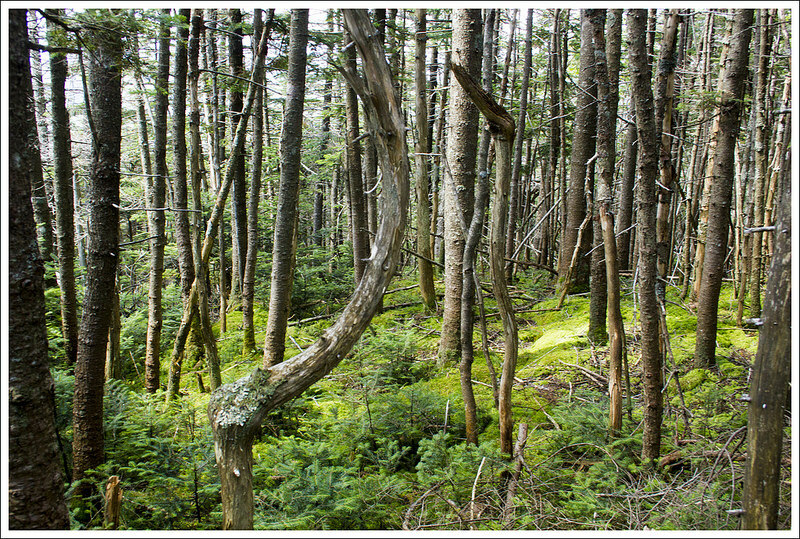 The trail starts off in a lush forest area and continues a steady, uphill climb until you reach the summit. The trail is fairly slow-going with the rockiness of the terrain. We were one of the first of the day to start the trail, but we were passed by someone that was trying to get to his work-crew assignment. The forest is so thick along the way. I felt I should get some views earlier on in the hike, but the tall trees keep the scenery at bay. Some of the rocky sections are larger flat rock faces that become very slick after heavy rains. As Christine mentioned, there is just one straight trail here until you reach the summit. At 3 miles, after ascending some larger rock face sections, the trail begins to rise as you reach the top of the tree line. Right before the summit, there are a few side trails on both sides (one to an obstructed view and the other to a rough campsite), but the summit was absolutely gorgeous. As we got to the summit, we were amazed at the views of the ridgeline of mountains to the left. This is scenery that pictures will never do justice. We climbed down to a lower rock shelf to get some of the dramatic shots above. This was one of those hikes that it was hard to convince ourselves to leave. We made our way down with a faster pace and made it back to our car in under 1.5 hours. 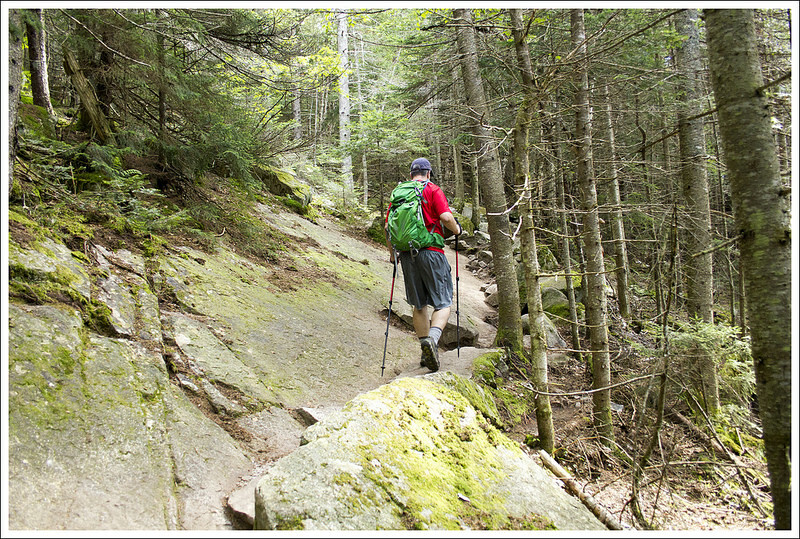 It was a great finish to our vacation and covering a few new hikes in New Hampshire. Difficulty – 3. This is a squarely moderate hike. 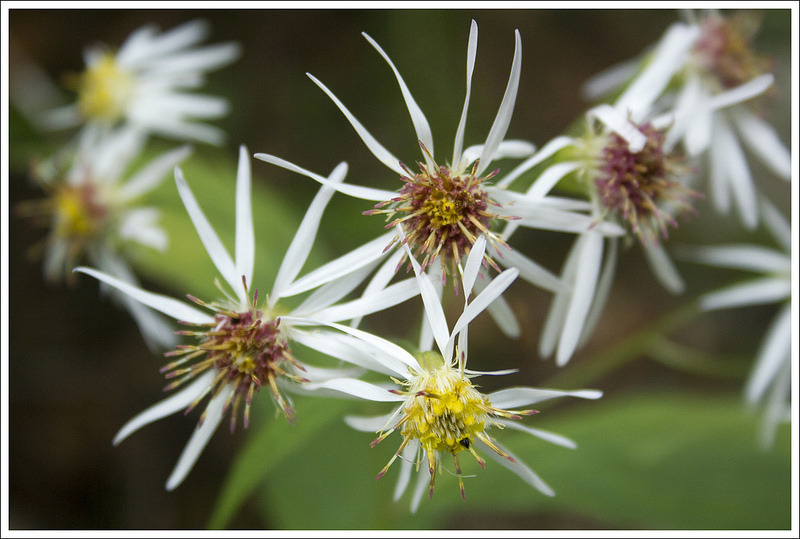 Trail Conditions – 3.5. Everything in this area is rocky and challenging. Views – 5. Very beautiful and expansive! Waterfalls/streams – 0. Other than a few trickles down the mountainside, this hike was dry. Ease to Navigate – 4.5. Very easy to follow – pretty much a straight shot on the one trail in the area. Solitude – 2. This is a popular hike due to it’s moderate climb. I just stumbled across your site….I certainly bookmarked it for future use! 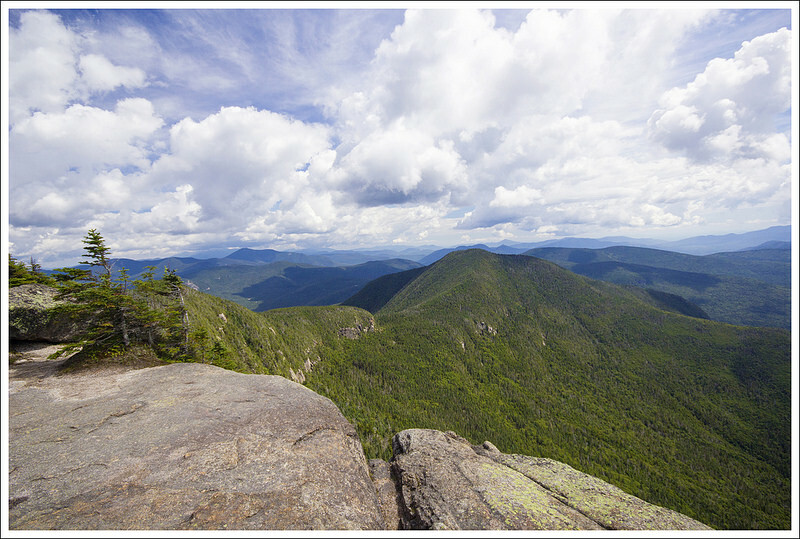 Headed to New Hampshire this summer to hike! Thanks! Thanks for the visit, Erik! We’re planning another NH trip this summer, too. I can’t get enough of the hiking up there! Funny – When I did Osceola many years ago, I came up from the other side. I later learned that one section of that approach is described as one of the most strenuous hikes in the White Mountains. I recommend it on one of your trips to New Hampshire. You can detour and visit a few nice ponds before starting the climb. Matthew – we visited the nice ponds on the other side when we did the Greeley Ponds hike several years ago!